There are some big changes at Truth! A new build, vending system (store credit), and new textures packs! My favorite Blonde color seems to be “gone” and replaced with LightBlondes 01, its less platinum sister. Rest in peace, Swedish Blonde. 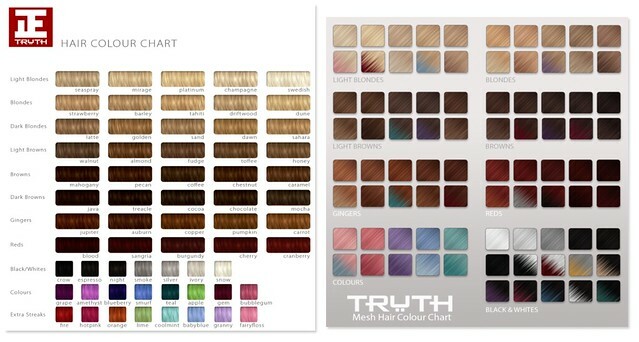 Shown above is a picture of the old hair colors chart vs. the new one. As you can see, tons of colors are gone, and replaced with similar (but fewer) color choices. I’ll miss the Coolmint and Fairyfloss too colors too, they were so vibrant and lovely. Truth has six new hairstyles out, and my favorite is the Sadie, cos it’s so retro and cute! It also includes a color-changing bandana headband. I took these photos at the artilleri sim, cos Antonia Marat is the retro queen in SL, even if she’s on a long hiatus or retired from SL creating. What do you guys think of the new Truth hair colors? Did your favorite color survive the cut? Mine – expresso – did not, and I’m upset about it. Expresso wasn’t black or brown but a rich mix of in between. Now there’s just black or a not that dark brown. The new textures generally seem to lack the depth of the old ones. Truth hair is wonderful, but I don’t have a spot anymore on the playlist and I maybe just retire from hair shopping for some time to come. His new colors make me sad. I LOVED the fades pack, it had such a variety of colors plus the ombre effect for just 50L more per pack! Now his variety pack (which does have more colors) is 400L for the same kind of variety in the fades pack but just for solid colors. Also, the roots option are gone, which I also really liked. I’m happy he had a sale though (even though he took his demos off the marketplace during it which made lag a ton worse). I got all the hairs I wanted (minus a prim one that was still 75L). I probably won’t buy from him again unless it’s something I desperately want due to the drastic changes. I like the new colors, because it’s less dramatic and bright colors. i wasn’t much fan of the old ones because the colors was too unrealistic for me and never fit any of my skins , but hey. it doesn’t hurt trying to get used to the new colors, because it’s always nice with some changes. Oh no! My 2 fav colours are Expresso and Swedish Blonde. wuaahh. P.S The Gattia hair is beautiful, did a quick search and can’t find it on MP, is it in-store or is it a special event release? i always used champagne. it is quite similar to the lightest blonde and the color you are wearing. i will still drink some wine tonight… pretend it’s champagne. i’ll put some pop rocks in it. I think the change is an improvement. I like the new textures a lot and the browns are way better now. My only complaint is the fades. I was buying the fades pack in every hair I got at Truth because I wear blonde hair, brown, or red and I could get all those in one pack. Now I have to buy each color individually if I want them all. But I guess its not a big deal because there were lots of the fades that I didn’t even like. I think my favorite color made the cut? I was wearing “seasand” most of the time and one of the fades looks pretty close if not the same. I actually like the new colors better…especially the blondes and light browns…in fact, tho I love Truth hair, the colors seemed a little off on my avi so I didn’t buy many, but now……..omg! Hairgasm! LOL! i, like you gogo, am mourning the loss of swedish blonde. 🙁 i really wish it hadn’t been removed, i’m not sure i like the lightest blonde available as much. I may grow to like the new ones, but as for now… I’m surely glad I’ve a decent stock of the old! Not wild about the new colors. I too liked Espresso, as it was perfect “darkest brown” but putting a light brown overlay on it (edit it from inventory list and change color) will yield the same result. I think maybe Truth was tired of having so many variations of hair colors. To me, there are more colors that are not terribly distinct from one another. Sadie reminds me of Antonia’s hairstyle with the scarf. I wore Swedish Blonde from the light blondes and Seasand from the natural fades pack. There is something similar to Seasand but it’s not the same, which is regrettable. The names made it easier for me to find the shade I was after, but I’m sure I’ll adjust. Other than that I really love the new textures and styles ~ I’m glad I grabbed Haven and a few other newish styles at the sale so I have them in Swedish Blonde and Seasand. Very bummed about the colors. Marmalade was my standard and I’m hearing its gone. Though I’d change styles a ton and even designers, I’m one who was always a realistic redhead/auburn color. So I don’t really just shrug and pick the next color up or down easily 🙁 Wonder what the thought process on that is from a business standpoint. Once the color texture is created, the designer is golden right ? Not like having a bunch more colors impacts ‘warehouse’ space ? I love the new textures, but am mourning my colors as well. I always bought the black and white packs and usually wore Ivory or Espresso. But now they are both gone 🙁 BUT if you are missing your fave blonde, one thing you can do is edit the hair itself to try and find the right tone. So, since I bought the black and white packs without knowing ivory was gone, now I wear the whitest color, and edited it to be as close to the same shade of ivory as possible ( I wore two hairs at once, one in ivory and one in the new white-so I could match). I got pretty darn close and I’m happy with it!